The history of the Pit Bull varies depending on the sources you refer to. In fact some sources go so far as to claim the Pit Bull is not a pure breed at all. This is an often perpetuated myth by registries and those in the humane care community that do not support the Pit Bull breed and others that do not understand the Pit Bulls well established history as a pure breed or what it takes to meet the standard of a pure breed line. The Pit Bull in fact has a lineage that goes back further than most other considered pure breeds in existence today. The most reliable history on the beginning development of the Pit Bull, goes back to the time of the Romans. During the time of Minos in Crete the sport of bull baiting was quite a popular form of pagan worship and entertainment. This sport was developed as a part of the worship practice in honor of the warrior god "Mithras". During this time most dogs were wild and ferocious by nature. As the Roman tribes of the time conquered and moved across the land they also took the sport with them. Due to the selective breeding of the best dogs a distinctive breed began to emerge. By the 1700's there were two primary bull baiting dogs that had developed. This was the Blue Poll of Scotland and the Alunt from Ireland both of which were referred to as bulldogs. The Alunt of the time resembled something closer to a Great Dane but is presumed to have later developed into the Alono of Spain as seen to he right. As this and other dog working and sporting activities were developed people selectively bred different dogs to achieve the working attributes that they most desired. They often mixed these breeds with the great dogs of England which by this time were also used to bait bulls. By this time in history it was thought that the use of the dog on a bull had a tenderizing effect on the meat. In reality this was a myth perpetuated by dog men and gamblers in order to encourage participation and thus draw the profits off gambling. By the time of the early 1800's due to selective breeding a dog had emerged which was very similar to the American Pit Bull of today. Due to a slow economy and laws which prohibited people of low economic means from owning a sporting dog the practice of bull baiting began to diminish. 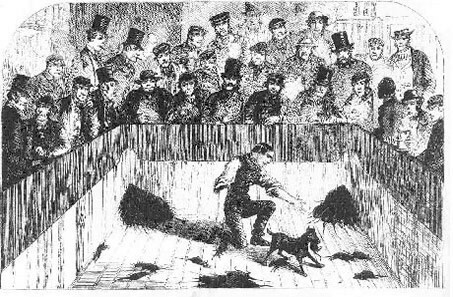 In 1835 bull baiting was officially banned. This forced people especially of the lower classes to find alternative work for their dogs. Unlike today's life of privilege the Pit Bull often leads the dog of that time had to earn its dinner along with every other capable member of the family. Dogs of this time were integral to survival and were worth their weight in gold for their abilities to hunt, herd and guard. Terriers known for their small game drive were soon being introduced modeling the breed into a more compact and smaller package. This emerging breed excelled at all kinds of work adding to the list of qualities it had so far attained. At this point the sport known as ratting soon emerged. This involved placing a number of rats in a literal pit for a specified period of time with the dog. The larger the number of rats killed by the dog the better the dog placed in the match. THIS IS IN FACT WHERE THE "PIT" IN THE AMERICAN Pit Bull TERRIER NAME CAME FROM NOT FROM FIGHTING OTHER DOGS. During this time the bubonic plague was also of great concern killing millions world wide as it was often spread by rats harboring fleas that carried the infection. A good ratting dog on the farm to control rodent populations in many cases was paramount to survival. The sport of ratting soon caught the eye of noble men and people of economic industry and wealth. The sport grew to have a complete diversity of participation all the way from migrants and hobos that just arrived in town to those of the most high esteem. Notice in the illustration the hats of the men participating. Hats at the time were used as a status symbol. Rarely will you see historical events where there is such a wide variety of hats and participation by members of every socioeconomic class. A interesting and little known fact is that Teddy Roosevelt worked ratting dogs in the basement of the White House. As with today the ownership of the Pit Bull crosses all ranges of human diversity and is often seen as a point of unification by those who are enthusiasts of the Pit Bull breed. Most Pit Bull owners feel although in some cases we may have to keep our love for the breed hidden from society in general we also all in a sense belong to a Family with the Pit Bull being the common bond. At the American Pit Bull Registry we help make this a reality and help to show people they are not alone in their love and support of this most magnificent breed. Due to the constraints of space and the agility of the Black & Tan and now extinct White terriers of England these terriers were often being mixed with the old bull baiting dogs to achieve dogs which were premium at a full range of working purposes. It is believed that this practice of mixing bulldog's and terriers had its most official beginning in the town of Staffordshire England and became known as the Staffordshire Bull and Terrier. Due to the agility and gameness being developed in the breed many owners began to also compete their dogs in other activities including matches against each other. Some did this to develop a most dominant model of this already dominant breed some did it for even less noble purposes. Soon competitions became so popular that practically all Inns and Pubs were equipped with a sporting pit. Many today are under the misunderstanding that Pit Bulls were bred historically for fighting against each other. This is a myth that has been perpetuated by some registries over time that have supported such activities. While some individual Pits have been bred for this purpose it is important to note that this is but an infinitesimal part of the the breeds background and has never been practiced by more than a small percentage of its owners. Dog on dog fighting has never been the true and full purpose of the bred as a whole and those who continue to make such claims only pervert history and taint the true nature and beauty of the American Pit Bull Terrier. As colonization of America and Canada began growing immigrants and explorers also brought their dogs. 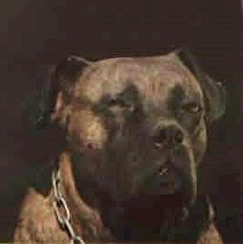 These dogs soon became known by the current name of "Pit Bull Terriers"
As time progressed a gentleman by the name Chauncy Bennett founded the UKC in 1898 with the American Pit Bull Terrier as its foundation dog breed. This is in fact when the officialization of the American Pit Bull Terrier ( APBT ) as a breed is recorded. Due to the protective nature many Pit Bull owners had at the time of their dogs many refused to register even though the breed standard had become officialized. Today many Pit Bull owners still continue to not register their dogs due to privacy concerns - especially with rampid Breed Specific Legislation ( BSL )- financial constraints and subsequent loss of lineage determination. Today the Pit Bull breed is in fact the most unregistered pure bred line of dog in existence. This has fractured supportive services to Pit Bull owners and over the years has worked to severely diminish the value of the Pit Bull breed as a whole. Here at the American Pit Bull Registry we seek to turn this trend around and to register ALL American Pit Bulls and encourage people with Pit Bulls registered among other registries to dual/multi register their Pits with us as well to help support their accurate historical documentation. The history of the Pit Bull is quickly disappearing and being re-written. One of our goals at the APBR is to capture the true history before it is gone forever. 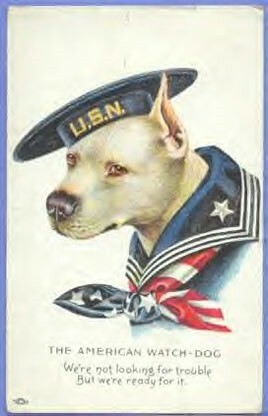 By the time of WWI the American Pit Bull Terrier had became a well loved and desired dog breed of choice. 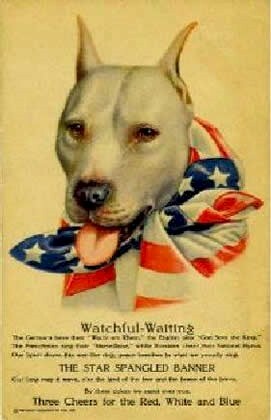 In fact the Pit Bull was used as America's canine military mascot of the time as seen in such posters as these during war time. In 1917 a Pit Bull by the name of Sgt. Stubby became a war hero for saving several soldiers lives and even capturing a German Spy while in the trenches of France with the 26th Yankee Division. A bust of Sgt. Stuby was even donated to the Smithsonian for historical purposes. 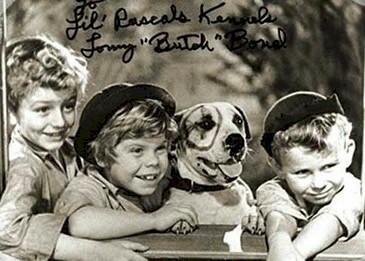 Later the Pit Bull breed was used to signify sturdiness, dependability, and loyalty by such organizations as RCA, Buster Brown shoes, and even the loveable Pete of the Little Rascals. In fact the first dog to travel across America in a car was a Pit Bull ( Bud ) and did so also with the first persons ( Horatio Jackson and his assistant and "bicycle" mechanic Sewall Crocker ) to cross America in a car ( a Winton named the Vermont). During the trip Bud would assist in watching for large bumps in the road and often received as much if not more attention by the press than did Jackson. 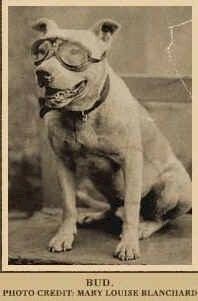 Horatio later donated Bud's goggles to the Smithsonian Institute in Washington D.C. After the trip was completed Bud bravely guarded the Jackson home until his death of old age. To order a film, book, or learn more on this trip click here. Presently the Pit Bull faces many challenges as its history is continuing to be written. As an advocate for responsible Pit Bull ownership and promotion the APBR is dedicated to preserving the history of the past and is dedicated to once again bringing shameless pride back to ownership. While it is true that the term Pit came from placing breeds of certain types into a literal Pit for sport the sport the "Pit" actually got its name from was however was "Ratting" where rats were thrown in a literal "Pit" along with a dog to see how many rats the dog could kill. The term Pit did not come from fighting with other dogs.